Guys, would you believe my computer is down again with the same issue? Yes! I can't believe it myself! I think I only had it back for a week and when I went to open it up there it was again: the black screen. I could have cried. I immediately drove back to the Apple Store to have it diagnosed again. All my pictures are still on my lap top; I didn't even have time to put them on a CD or flash drive in the short time I had my computer home. So I'm back to using only my IPhone again. I can't blog on my phone because all my pictures are on my computer. But I am on Instagram as ameliasfleurs where I post daily, and on Snapchat (still figuring Snapchat our). Hope to see you there! This is a continuation of a travel series of a road trip I took to Las Vegas in May with my husband. To start at the beginning read THIS POST. The rest of the posts are HERE, HERE, HERE, HERE, HERE, and HERE in chronological order. Even with the best laid plans and intentions, bad things can happen when on vacation. My husband and I have taken so many road trips in the past few years and have never had any real problems until this vacation. We were both really worried about this trip for it was not only going to be the farthest distance we've ever traveled, but we were also literally crossing a desert with a small Chevrolet Malibu with close to 100,000 miles on it. Since my biggest fear was the car breaking down in the middle of the desert with no town or services for hours away (and no cell service), we took our car into the dealership to be checked over and have service done. Then to be double safe, we took the car in for a second time to have the brakes redone and new tires put on. We thought we were good to go and we were ready to drive hours into the middle of nowhere with full confidence. Now, the reason my husband and I love to travel (other than to explore and see new places) is to spend quality time together. We always feel every vacation brings us closer together...until this one. This drive was so STRESSFUL. If you read THIS POST about our drive to Las Vegas you would remember where I discussed how this drive was the most beautiful, yet terrifying drive I have ever taken in my life. All the pictures in this post are scenes of this drive...they will give you some idea of the amazing scenery, and also the dangers. Because of the steep inclines and winding roads, I was a nervous wreck for about two and half days. I felt my husband was driving way too fast (even though he was going under the speed limit, which was 80 MPH by the way), and I didn't like how he was using the cruise. I cringed every time the engine revved up to climb a hill. I kept telling him to slow down, don't use the cruise, take it easy on the curve, watch it!...... needless to say I was driving him nuts which resulted in a lot of bickering all the way there. So much for our romantic getaway. I was so disappointed. We were both so stressed out before this vacation we really needed a break. We were both looking so forward to being alone together, and now, we were at odds. I felt farther away from my husband than I did before we left, and more stressed out than ever. But, we finally made it to Vegas, parked the car, and knew we could relax for three days until it came time to make our way back through the desert again and head in the direction of home. We woke up around 5:00 a.m. anxious and eager to leave Vegas and see Zion National Park. We checked out of our hotel, loaded up the car, got in, and my husband very nervously put the key in the ignition and it started! Yay! It still work! And then, it stopped. "Don't panic, don't panic, don't panic"' I said to myself. He started it again. It stalled again. He started it again. We were parked in the very top of a tall parking structure, he managed to get it going again and somehow coaxed the car downhill out of the garage. He said "Everything should be fine, sometimes when you start a car up again after driving it hard for three days it's just stalled up". Well, that makes no sense. I was panicking. I knew what we had to drive through. I knew there was nothing, absolutely nothing, for hours and hours and hours. How are we going to drive through a desert with a car that keeps stalling? "I just need to get the car out of the city and onto the highway where I can give it some gas and hopefully clear the engine.". O.K. that makes sense. Start praying. "Lord, please help this car make it to the highway, please help this car make it to the highway.". Then the dashboard lights up like the 4th of July "Check Engine, Check Engine, Check Engine!". "We can not drive this car through a desert!" I scream to my husband. I then get out my trusty IPhone (Thank God for modern technology by the way. I don't know how people ever traveled before without Smart Phones), and googled Chevrolet Dealership. I found the nearest Chevy Dealership on my phone and had google maps lead the way. Thank goodness the car made it to the dealership and we did not need to be towed. The dealership was open but the mechanics had not yet arrived. However, the nice young man at the desk said they should be able to look at our car right away. We then walked about a mile to a Burger King to have some breakfast. Although, I was so sick to my stomach with worry I could hardly eat. Then we walked back and waited, and waited, and waited, and tried very hard not to worry. My husband said "I don't think were going to be able to go to Zion National Park. We won't have any time". I was devastated. Zion National Park was suppose to be the highlight of this trip. I've seen so many pictures and read that it is one of the most beautiful places on earth. I didn't know if we would ever be this far west again, I struggled so hard not to burst into tears. I started to have a pity party. How could this happen? We had the entire car checked over not once, but twice. We were so diligent, so careful, so cautious. Finally, we received some good news. The car needed a new part (a sensor) that would only cost a few hundred dollars and if everything went well on a test run, we should be ready to go in a few hours. That was a relief. I was worried we'd have to ditch the car and find a new ride home. Or we wouldn't make it to our next hotel and lose the money we paid for the reservation. We were back on the road again before noon. Yay! Now we can go have some fun. Everything was going smoothly until we hit Arizona, then we hit the second worst traffic jam of our lives. But let me back up a bit. Normally when we travel, I always use my Smart Phone. Why? Because it not only gets us to where we need to go, but it warns us if there are accidents or heavy traffic and we can find an alternate route. My husband hates "The Lady" on the phone, so he insisted that I not turn our GPS on. I knew that he knew where to go without "The Lady", so I obliged this time. Plus, we were out west, in a desolate area....there wouldn't be any traffic jams. Boy was I wrong! They were repaving the highway and instead of doing just a small section at a time Arizona thinks it's A.O.K. to reduce traffic to only one lane for miles and miles with no where to get off! We were literally stuck in traffic for hours, and a lot of the time we weren't even moving at all and could turn the engine off. We saw so many cars making illegal U-turns to get off the highway and motorcycles were driving in-between vehicles just to get through. It was ridiculous. Sorry Arizona, but the Wisconsin highway department would never be so stupid to create such a mess. They would only have paved a smaller section of the road at a time and/or provide an alternate route. The worst part of this whole story was that there was a frontage road running right along side the freeway. Traffic could have so easily been diverted onto this road to reduce congestion. OR if I had my Smart Phone turned on, I would have seen the traffic jam and we would have been on the frontage road instead of stuck for hours in this mess. When we finally got through the construction zone and traffic lightened up, we were exhausted, tired, and stressed. We saw a Culver's advertisement and we were surprised to see our hometown restaurant this far west, so we decided to stop and have a bite to eat. We parked our car at the restaurant and as we got out an elderly lady saw our license plate and said "You must feel like your at home now that your at Culvers". We laughed and said "Yes." She was so nice and we engaged in some friendly conversation with her for a bit. We went in, ordered, then I looked at my phone and saw there was a text from my son. It said "Mom, you finally have good reason to make fun of Uncle...." and a picture. I looked at the picture and it was a scene from the comedic war movie Tropic Thunder with a caption underneath of how we should honor our veterans this Memorial Day. I burst out laughing so hard I started to cry. I showed my husband the picture and he said "Oh, no. He didn't!" and he burst out laughing. And before we knew it, we were both laughing so hard we could barely breathe and all the stress and worries of the day melted away. You see, my husband's uncle posted this picture on Face Book thinking it was a picture of real war veterans, when it was actually a picture of Jack Black and Ben Stiller dressed up in Army uniforms. Get the humor now? By now, it was so late in the day that all we could do was drive to our next hotel and call it a day. On our way there we passed Zion National Park which was covered in horrific grey clouds and my husband said "Maybe it's a good thing we didn't make it there, because we would be right at the top of that mountain right about now, in the middle of that storm". I agreed, but it didn't make me feel that much better. We got to our hotel in Cedar City, Utah around the supper hour and tried to find something to do but everything was closed. I felt like walking around a bit, so we even tried to find some nearby trails but nothing was appealing to us. I didn't feel hungry after a big Culver's lunch, so we skipped dinner and decided to work out in the hotel fitness center instead. After that, we just went back to our room and had a quiet, relaxing evening and started making plans for the next day. I remember when we went back to our hotel room after working out sitting down on the chair and saying "This is the worst vacation we have ever taken". My husband tried to console me, but I was so, so, so disappointed. We lost an entire day of our vacation because of car trouble and a traffic jam. We have been bickering ever since we left. A bum in Vegas embarrassed me. The Grand Canyon wasn't the experience we had hoped for. Was anything going to go right? My husband said to me, "I'm sure when you get home and start looking through all the pictures your going to see everything we did and think you had a great vacation. And were only halfway through our vacation. We can go to Arches National Park tomorrow and Vail or Aspen the next day. Don't give up on it just yet" And he was right. The second half of our vacation really was the best...but you'll hear more about that in the weeks to come. So why did I share this with you? For one, to let you know my life isn't always picture perfect and also to give you some tips of What to Do When Bad Things Happen When Your On Vacation. Here's what I learned from this experience. 1. If you have a Smart Phone, use it, whether you need to or not. If you don't need GPS, at least always be looking ahead on the map to see what traffic is like so you have time to plan an alternative route if needed. 2. Understand your travel partner. Even though we've been married for almost thirty years my husband learned something new about me on this trip. He learned that I really stress out about driving conditions and it doesn't help me to calm down at all by trying to get me to stop talking. And I learned, that even though I feel the car is out of my control, it's in his control, and I have to trust him that he doing his very best job. 3. Stay Calm when something goes wrong. Don't Panic. Maybe your day isn't going to go as planned...just be flexible and open to a new experience. So we didn't make it to Zion National Park, but we did go to Arches National Park...which was an amazing experience...and that was not in the original itinerary. 4. And now for the hardest one of them all....TRY NOT to take out your frustrations on your travel partner. 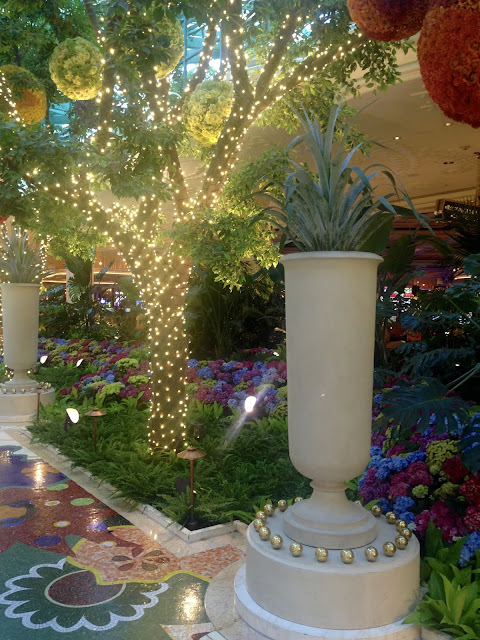 Even though we bickered all the way to Vegas about my husband's driving, neither one of us took our frustrations out on each other over the broken car or the traffic jam. We both stayed calm and cool. AND, believe it or not there was no bickering at all on the way back from Vegas. My husband drove a little slower and did not use the cruise, which kept me calmer and more relaxed. A win-win for everyone! We've been very lucky in the past to take amazing, perfect vacations, and this was the first one that was not so perfect. But, my husband was right, when I got home and started going through pictures I thought "Wow! We really did and saw a lot in those 10 days! What an amazing adventure we had!" A Mickey Mouse Card "Oh, Boy!" 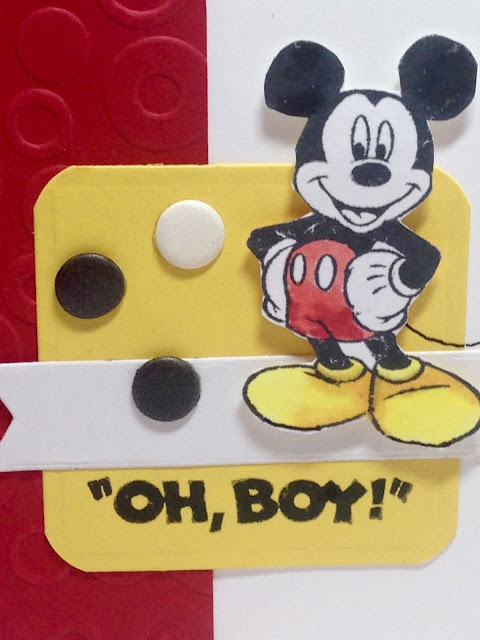 In last week's craft post I showed you a card I made for my daughter's birthday. This week's, it's my son-in-law Jason's turn. 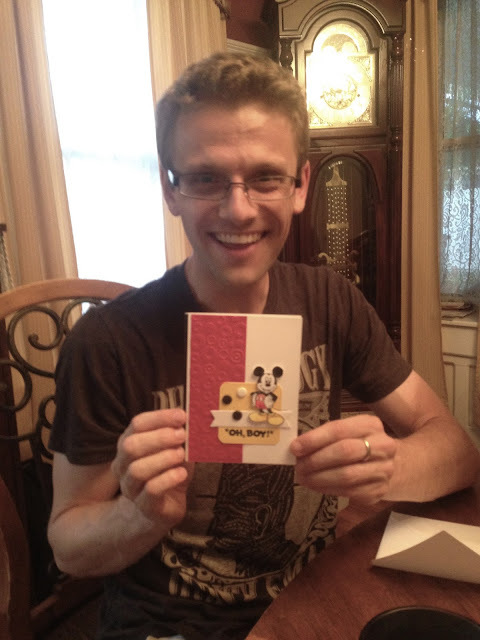 His birthday is only two weeks after Ashley and my son Jordan's birthday is August 29th. Since we had no idea when we would have all three children in the same place again, we decided to celebrate all three of their birthdays at once. Jason grew up in San Francisco and is a big Disney fan, so I thought he would enjoy this Mickey Mouse card. The image and sentiment are from Inkadinkado. I got the layout for the card from a card on Pinterest. 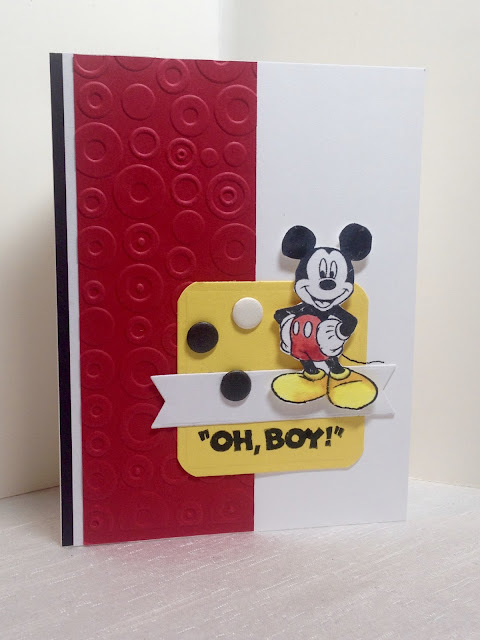 I stamped the Mickey Mouse image on a separate piece of card stock, colored it, cut it out and popped it up on dimensionals. 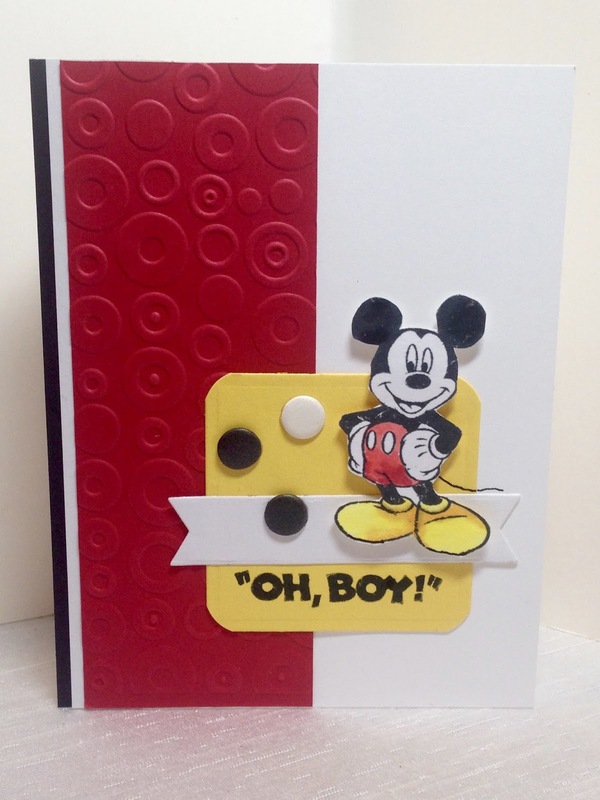 The red panel was made using a Cuttlebug Embossing Folder. The banner was cut with a MFT die, and the yellow panel was cut with a Spellbinder Nestability. I added black and white paper candy dots for embellishment. 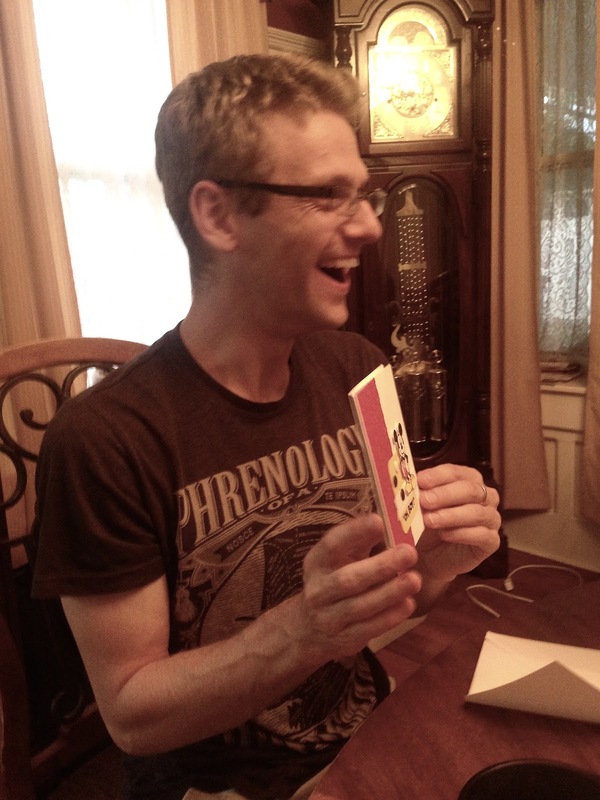 As you can tell by these photos Jason was thrilled with his card. He even started talking like Mickey Mouse saying "Oh, Boy" over and over again and had me in stitches. Had I known he was going to do that, I would have video recorded him; because it was so funny! 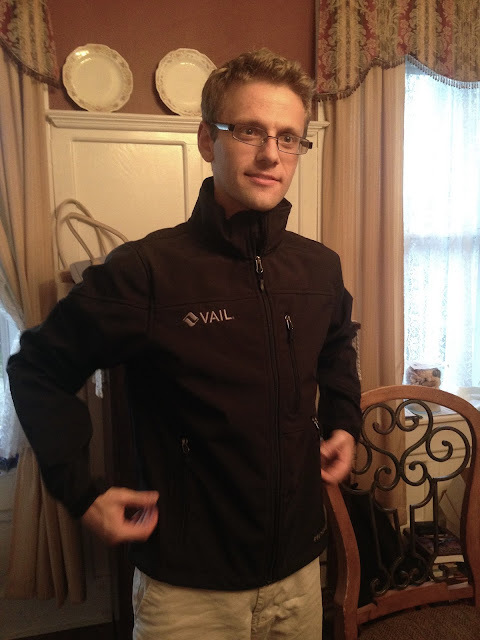 Jason's birthday present from us was this nice athletic wear jacket we picked up on our day trip to Vail, Colorado. Jason is really into running and we thought he could make good use out of a nice jacket like this. However, it's such a nice jacket, it's almost too nice to run in and get all sweaty, so he might just be using it as a nice fall coat. When I planned this outfit for my photo shoot I had no idea my yard was so lush and green that I would just blend in with my surroundings. :) Seriously though, my yard looks like the Amazon rain forest! We have gotten so much rain this summer, along with some very warm temps, that everything is so healthy and green! If I had spent more time in my yard this past month, I might have known this and picked a different photo shoot location. But I haven't been in my garden for weeks because of vacation, bonding with a new kitty, and a heat wave. If this dress looks familiar to you it's because you've seen it on THIS POST. I bought my daughter new clothes for her birthday and this was one of the items. Of course, I used the opportunity to do a quick photo shoot before I gave it to her. She doesn't mind, as I often borrow a lot of her clothes just for photo shoots so that I'll have something different to show my readers. The dress is a beautiful emerald green with a tribal pattern on it and an exposed back zipper. I wore a gold metal belt around my waist just to give an illusion of a waistline. I put a sparkly black knotted head band in my hair. I picked up the dress at Ross at a discounted price because it was missing the belt. It had belt loops, but no belt. No big deal I thought because both Ashley and I had plenty of belts that would work with this dress. My white aviator sunglasses are by Rocawear and I purchased them at J.C. Penney. The emerald green and gold earrings are from Stitch Fix. I wore more green jewelry on my wrist. Some of the bracelets look blue, but they are a very light green in real life. The cross body bag is a mint green color. My daughter gave it to me for Mother's Day. I love the perforated flap. 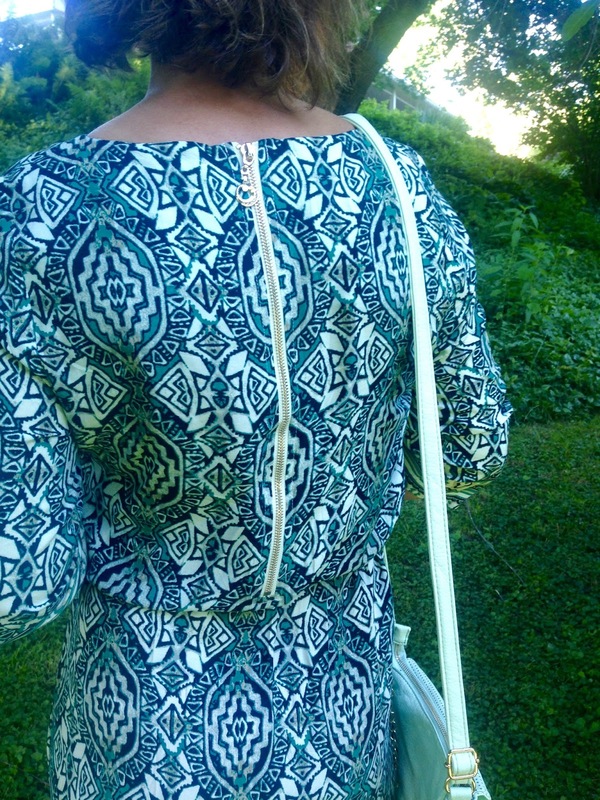 Both the hemline and the sleeves have a separate border pattern. The dress is on the short side, but it could easily be worn over tights or leggings in the winter if more modesty is required. It could also be worn as a long tunic. It's hard to see in the picture because of the pattern, but there is a button on the sleeves and a tab underneath the sleeve so you can shorten the sleeve length. I wore black gladiator sandals from Sears (old). I loved this dress so much, I didn't want to give it up. Oh well, it's a good thing I gave it to my daughter as I know I will always be able to borrow it! For a city in the middle of a desert, Las Vegas is filled with beautiful, bountiful gardens and flowers, and most are free and open to the public. 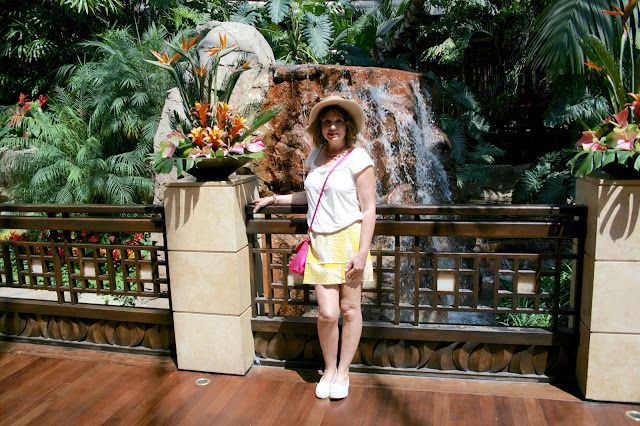 I'm not a gambler nor a drinker, but I loved walking the strip and enjoying the gorgeous flower arrangements and gardens. 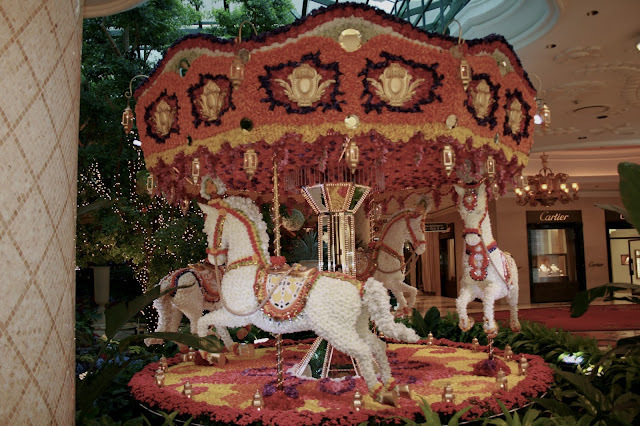 I've already done an extensive garden post on the Bellagio Gardens HERE, but I also wanted to show some other hotel fabulous gardens so I decided to do another post. The Flamingo Hotel has the prettiest and most enjoyable outdoor garden in Las Vegas. Why? 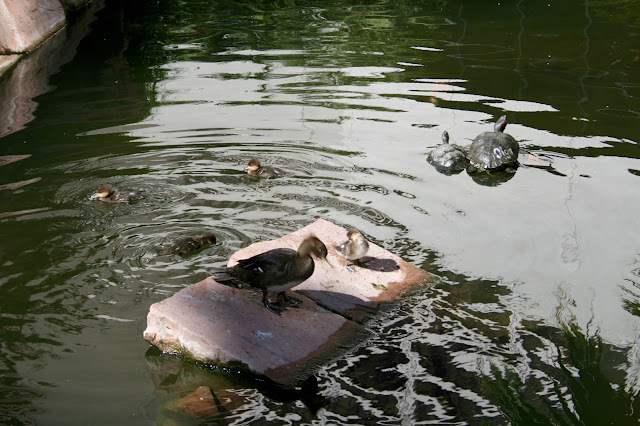 It not only has lovely flowers, lawns, and garden paths but it also has amazing water features and live animals. I loved their Flamingo water fountain! 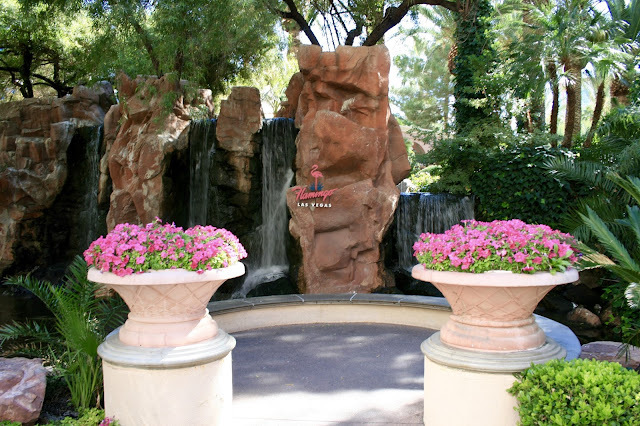 This is a beautiful water fall that provides a great photo opportunity with the hotel logo on the rock wall and the gorgeous flower pot displays bordering each side. 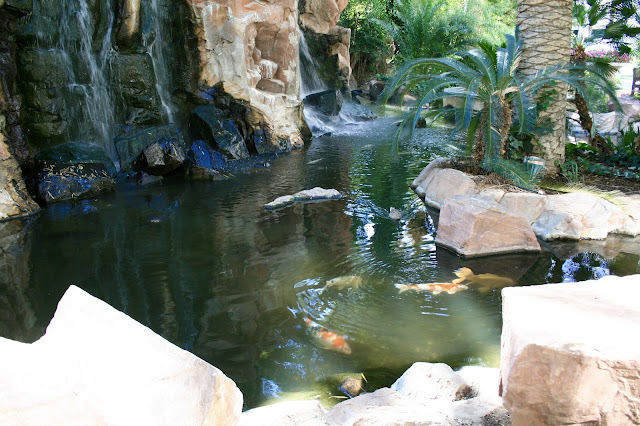 The water feature is filled with koi and many different kinds of waterfowl. 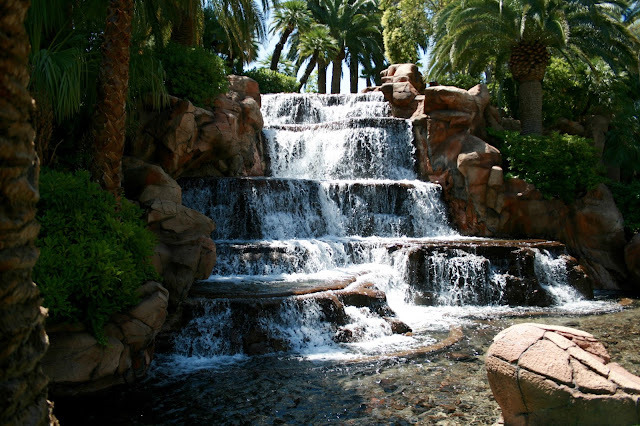 There are multiple water falls in the garden with all different heights. There were so many different kinds of waterfowl I couldn't possibly show them all to you. Here are some of my favorites. 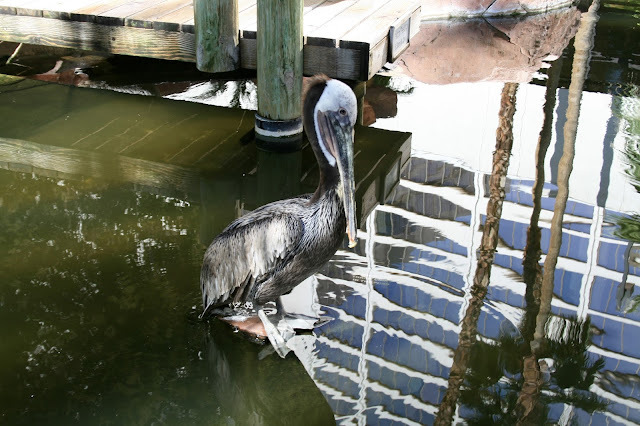 A pelican. A mother duck with her babies, plus some turtles. 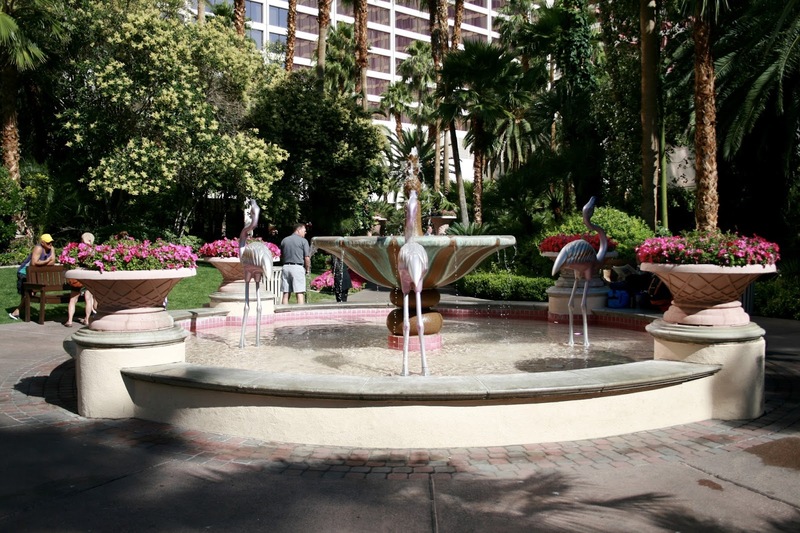 And what would the Flamingo hotel be without Flamingos? They also had parrots that you could hold under the guidance of the animal trainers and many, many different types of ducks. 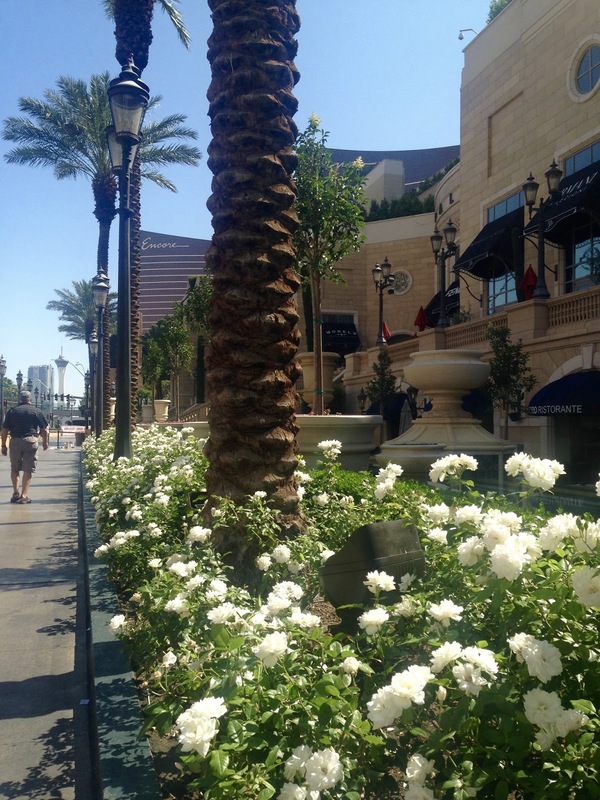 On the Vegas strip hotel, flowers and gorgeous well-groomed palm trees are everywhere. 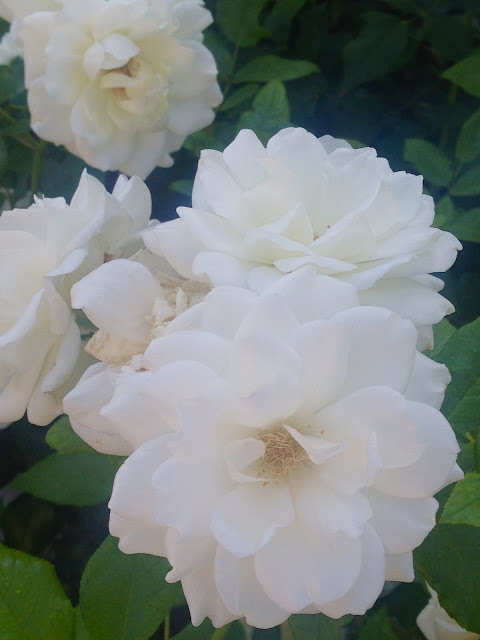 I loved this long bed of white roses. 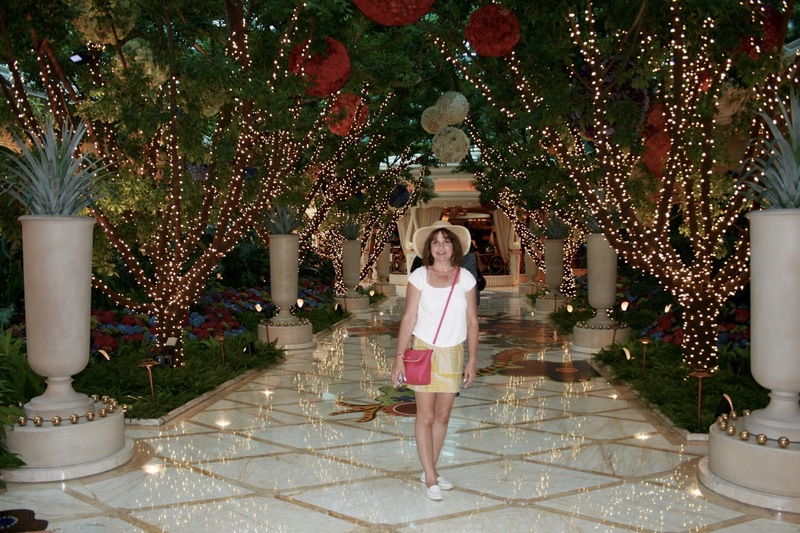 Like the Bellagio, the Wynn hotel also had a beautiful, ornate garden inside the lobby. This carousel is covered in flowers. The pathway is lined with trees that are all lit up. 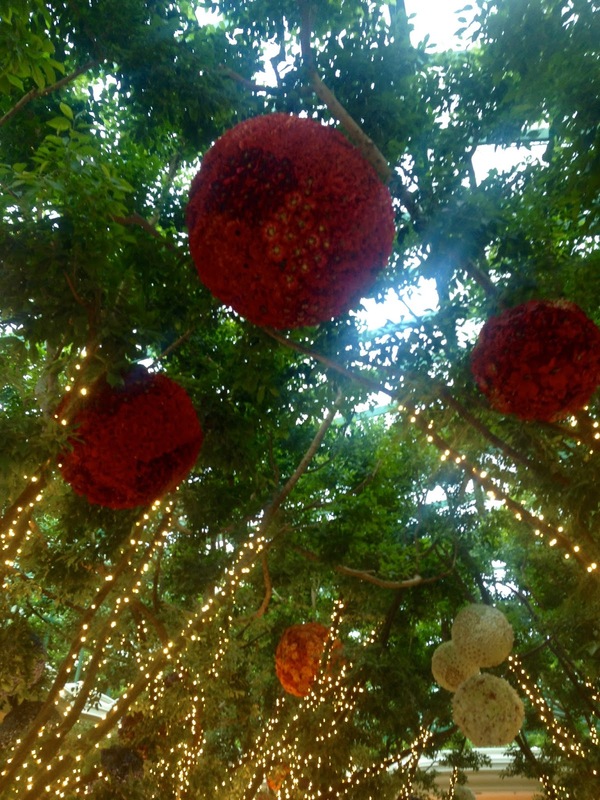 The branches canopy above your head and lovely flower covered balls hang from their branches. Here is a close up of the flower covered balls. I loved this flower covered hot air balloon. I enjoyed the beautiful colorful tile on the walk way as much as the flowers. 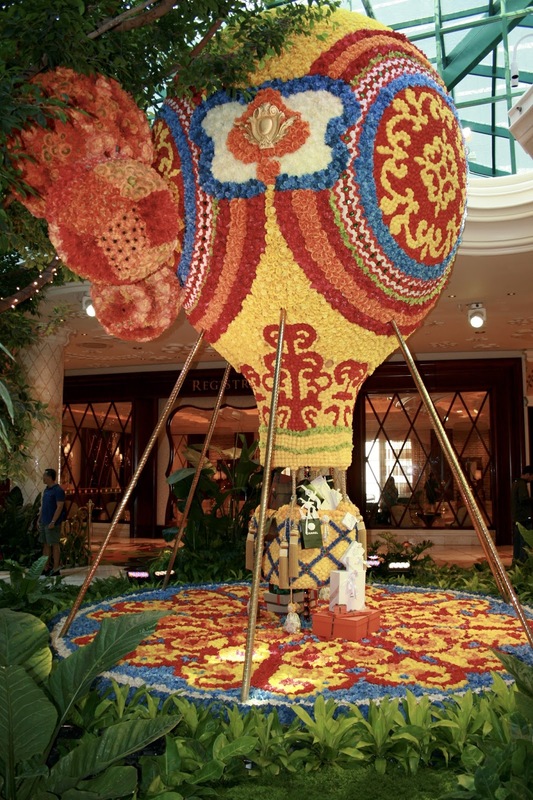 If you'd like to see more of the Wynn Hotel, check out this post HERE. I have their fountains and unique ceilings in that post. 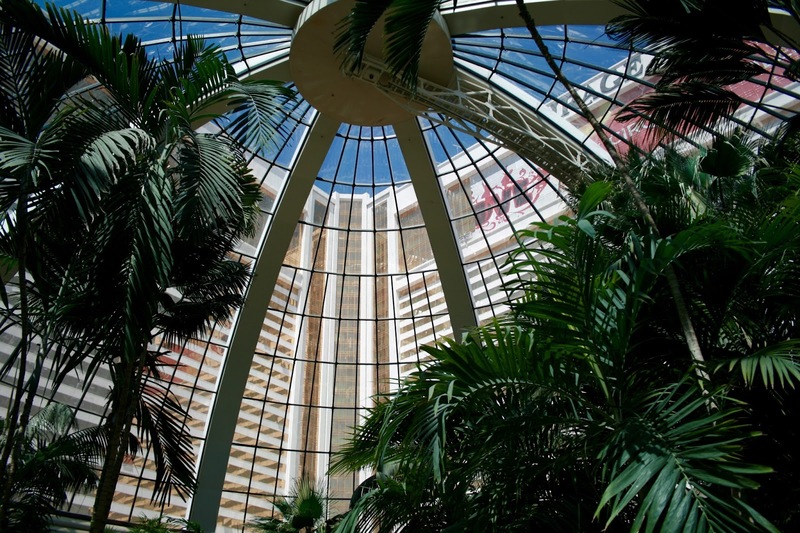 Another hotel that has amazing outdoor and indoor gardens is the Mirage. There is a large glass dome ceiling in the Mirage that lets in natural light. The tropical plants love soaking up the sun light. 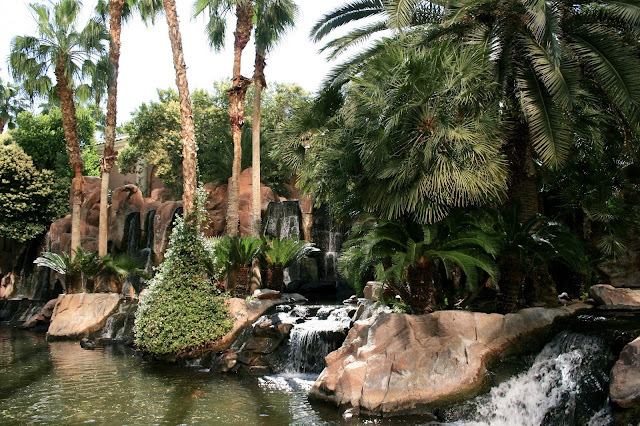 There is also a gorgeous water fountain and bridge inside the hotel. 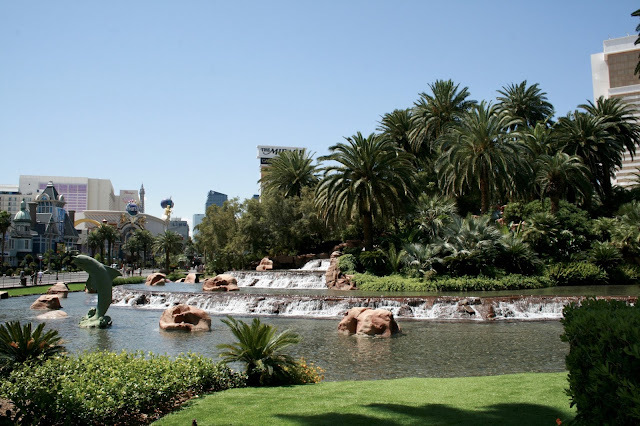 The exterior grounds of the Mirage are also breath-taking. There are numerous waterfalls, plus there is a volcano show after dark. The size of the exterior water feature runs the entire city block. They have numerous waterfalls from these small ones shown here to quite tall ones (shown in previous post, linked above). I also really liked all their dolphin states scattered about their water feature. 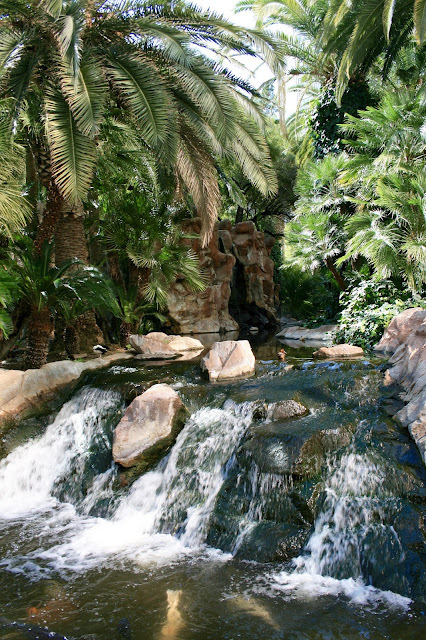 They have a Secret Garden and Dolphin Habitat at the Mirage as well, but we did not go to that as it costs about $22.00 per person. They also have lions, tigers, and leopards in this area to view.